I'm so excited to be one of the blogs participating in this reveal! I know that I've already added this book to my must-read list for 2013. And now, without further ado, I present THE BEAUTIFUL AND THE CURSED by Page Morgan! Yet no one seems to be concerned about Grayson's whereabouts save for Luc, a devastatingly handsome servant who has some secrets of his own. There's one secret about the city that he can't keep hidden, though. There's a murderer on the loose. And every day Grayson is missing means that there's less of a chance he's alive. There is more! 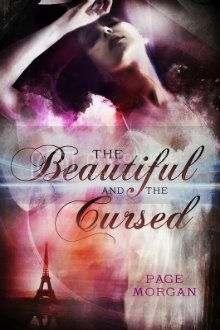 Enter for a chance to win one of two ARCs of The Beautiful and the Cursed! Giveaway ends at midnight October 12, 2012. You may earn extra entries by referring others to this cover reveal and giveaway. They must name you in the Rafflecopter form for you to get credit. You'll receive one extra entry for every person who names you. Thank you for spreading the word! oh wow that cover is gorgeous!! I REALLLLLY adore it! I LOVE this cover. I am obsessed with Paris and especially the Eiffel Tower!